Met interesting folks along GMR today. 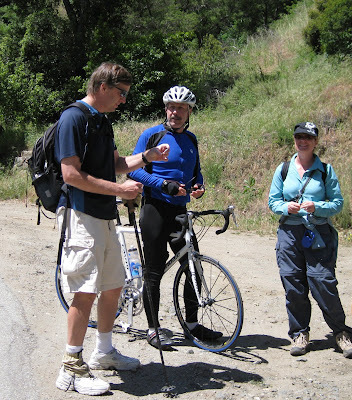 The first being Joe at the first saddle, who recognized me and praised my work. Then Jason and his crew on their way to Baldy Village. Bill who needed to feel a real mountain under his tires and Sean from Texas who started riding bikes when he was a teenager. He got to see Lance before he was famous. Caught up with Brad at the shed who talked up a Three Harbors tour in July. His US Coast Guard kit and thirty years of service were good reminders for Memorial Day. Pictured left to right: Lucas Brenes, Kevin Brenes, Doug Hall, Michael Shein and Jason Lupo. Two other juniors on the mountain today (not in the photo)... Nathan Rico and Jordan Hirschmann. These young Sho-Air Juniors had more energy that most cyclists. Their power to weight ratios were phenomenal. Professional riders in the making. As I passed out my website cards, I heard another voice of, "hey I know this website.!" Thank you! Mandy of Adobovelo was on his way to the ski lifts a second day in a row. After a double lap of ski lifts on Saturday. Perhaps I need to acquaint you with the Sho-Air Juniors! Sirens blared through the canyon this morning at 10:30 am. This time from SR 39. 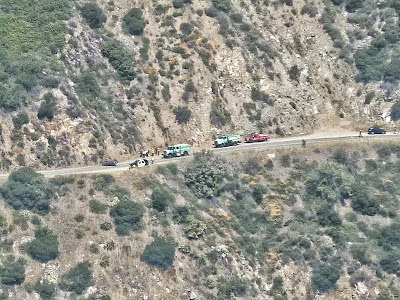 An overturned car blocked traffic as US Forest Service, police and ambulance were on scene. Photo courtesy of Bill. Taken at Newman's Point. Excellent zoom. 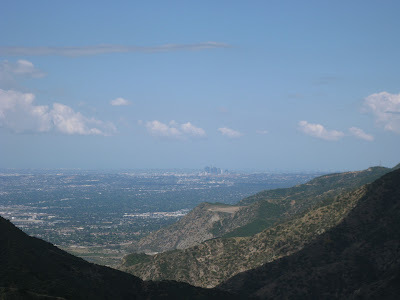 My ride up Glendora Mountain Road started early with the promise of warm temperatures in the high 80s and a clear blue sky to the north. Rode out around 7:40 am in the upper 50s. The goal was Baldy Village a 46 mile round trip, the pace was moderate. The traffic was light for a Saturday. Perhaps folks were enjoying the three day Memorial Day weekend. Stopped at the shed and met Earl. He struck a pose and I took a picture. NOT! The camera beeped. Damn! No memory card to record the pictures. Matt arrived at the shed a few minutes later. Then a Pasadena Triathlon Club support truck pulled in. The driver kindly offered us water and Hammer Heed. Perfect! Earl rode another two to three miles along Glendora Ridge Road. Matt reported he heard the sirens. I thought it was the Santa Ana winds playing tricks on his ears. Then I heard it. The hope that the emergency vehicles were destined for the Azusa canyon side evaporated as the US Forest Service truck blocked traffic at mile marker 3.74 to allow the search and rescue helicopter to land. It created a dust storm and having ridden in a helicopter I knew to respect the rotating blades. The 10 minute wait turned into half an hour and the peloton grew from two to thirty cyclists. Met Lee with his beer view mirror and hilarious chap in an Once kit, Juan and Willie, Ron a regular, and Francis of Adobovelo. The PTC pack swelled. The emergency was an injured motorcyclist. He was transported by ambulance to a local hospital to treat his thumb. When they opened the road, I took a rear position. The wall from mile marker 5 to 8.3 didn't seem as bad, perhaps it was the ibuprofen for the heel pain, or the SR39 effort to Angeles Crest Highway that made the ride seem a bit easier. I followed a rider in a black kid but never quite caught him, then I passed Juan and Willie on the road side fixing a flat tire. The equalizer, in Willie's terms. Another fellow rested in the shade. Ahead a group of three riders, I was quickly approaching. One rider was very distinctive in their white compression socks. The fun of catching and passing kicked up my speed. I stopped to move water bottles and was passed! doh! then caught them again on the uphill only to be passed on the downhill. One last time I caught them on the uphill and the wind really put a kabosh on my speed. It was good to have the fellowship on the road. Or was that competition. Cruised past the post office. The PTC club truck had a swarm of riders and headed for the visitor center. A quick turn around and watering at the post office. A cool 69 in Baldy Village. I had a slower ride back. It's not all down hill. The sky was blue to the north and a layer of brown smog to the south. The water from the post office was cooler in the mouth than the PTC water. A rear water bottle squirmed out of the rear cage on the downhill 25mph descent. I snugged it in on the right side. Got home at 1:30 pm. First trip to Baldy this year. It was a perfect day and a good ride. Note, the pictures are from Matt's cell phone. Thanks Matt. Wednesday turned out to be spectacular day, a bit breezy. Dale and Elle caught me at the first saddle. They rode up GRR and met up with Ray. Met a fellow from Santa Cruz, who lives in mid-town LA. He raved about Bikerowave.org a do-it-yourself bike repair shop. Folks who ride bikes in downtown LA are courageous in my book. He scoped out GMR for a ride this weekend. Perfect respite from the towers and freeways. Sunday was even clearer than Wednesday. More good news. 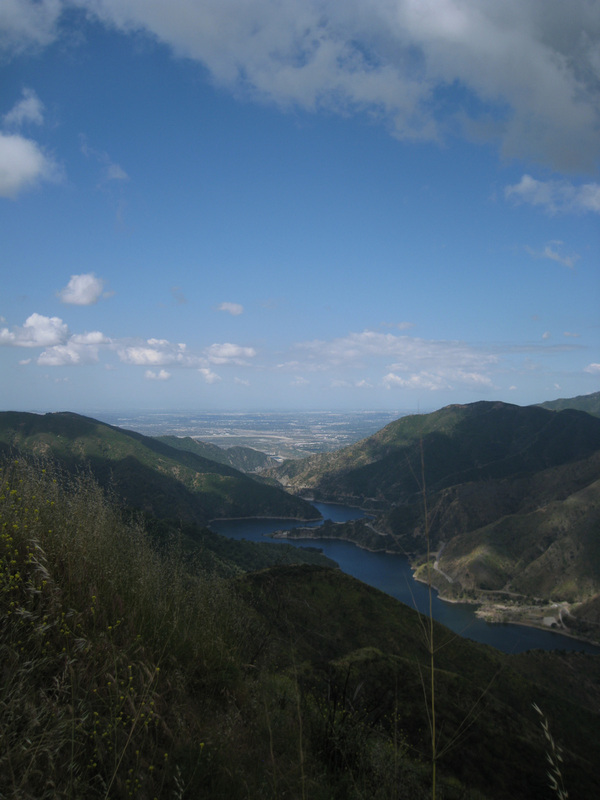 US Forest Service is opening West Fork of the San Gabriel River and Rincon for recreational activities. UPDATED. New links for Stage 6, and SC Velo at Stage 6. Here are the best of the seven hundred photos Bill and I took at Stage 7 of the Tour of California . We were up close and personal at the end of the race. It was good to get back to "the road" and meet in person on-line friends. 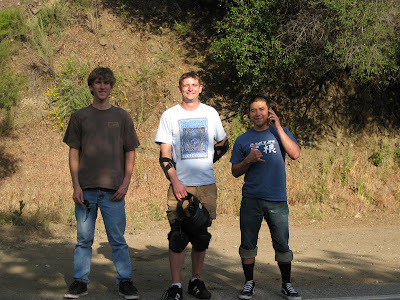 John, Ian, Eric and I chatted about other great adventures, SR39 and Chantry Flats, new skid marks and battered trash cans, broken berms and fast downhills. We agreed life is good on the road. 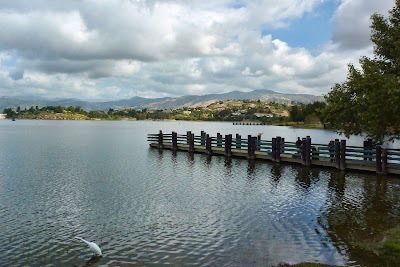 Today is the last stage of the Amgen Tour of California in Thousand Oaks. 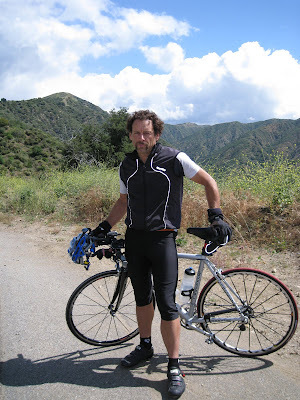 I needed my own ride on familiar turf along Glendora Mountain Road. Very few cyclists today. Rode to the top of Monroe in a good time. The weather felt more like January, clouds, cold. The visibility was clear. The towers of LA were gleaming bright. The afternoon slipped away with bicycle cleaning, tire replacement, and family. So the stories have been skimpy while I get homework done. Bill and I took five hundred pictures from two days of Tour. We have selected around one hundred. I expect to have a link tomorrow. I did meet up with a Sunday regular, Frank. Email isn't getting through, so here is your picture. An interesting day in Los Angeles at the 2010 Amgen Tour of California Stage 7 with Bill, Jason and myself. Here are the first photos. Drove west out of Wrightwood around 8 am. Past the Blue Ridge KOM. Team Velocity had an eight man posse climbing up the hill. 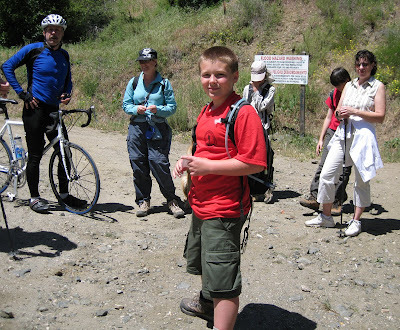 Stopped at the Pacific Crest Trail head parking. Only one other car blaring loud music. I could feel it in the air. This wasn't it. Drove on to Dawson's Saddle. More life. Yep this was it. Elevation 7931 feet. "Stage 6 is going to hurt us all" -- Lance Armstrong -- "It looks like a seven hour bike ride". My plans have changed. I am no longer contemplating riding SR39, I am choosing an alternate route. See the message from the Amgen Tour of California website. 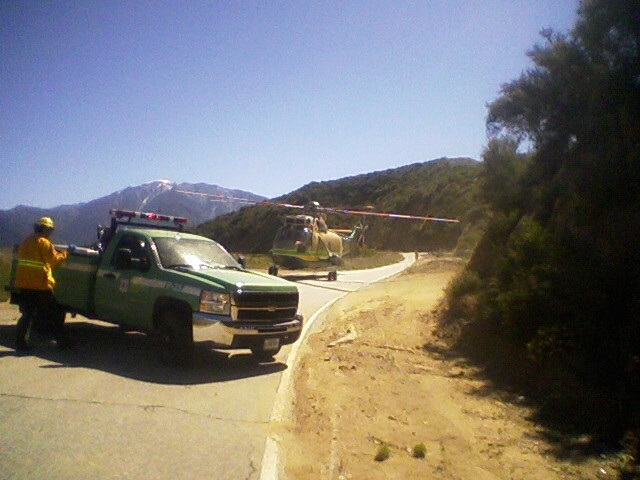 * Access to Angeles Crest Highway (Hwy 2) is closed just north of La Canada Flintridge. 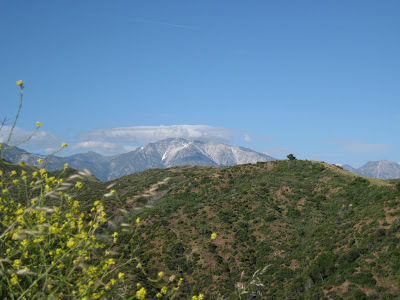 The only access is via Upper Big Tujunga, Big Pine Rd, or via Hwy 2 through Wrightwood. Hwy 39 up to Hwy 2 has been closed since 1964. You can see that route on the maps, but that route is closed by gates and there is constant construction projects on Hwy 39. There are large sections of Hwy 39 that have been removed. You will not be able to get through via bicycles. * Hwy 2 has recently reopened from the standard winter closure. 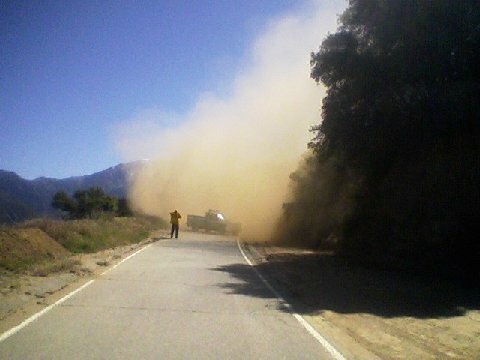 Caltrans is still working on several sections of the road. The National Forest Service has advised the race that you will not be allowed to park overnight on any section of Hwy 2. The Park Rangers will be prepared to cite anyone that is parking overnight. * Parking will be limited. There is still a significant amount of snow on the side of the road. Plan accordingly. 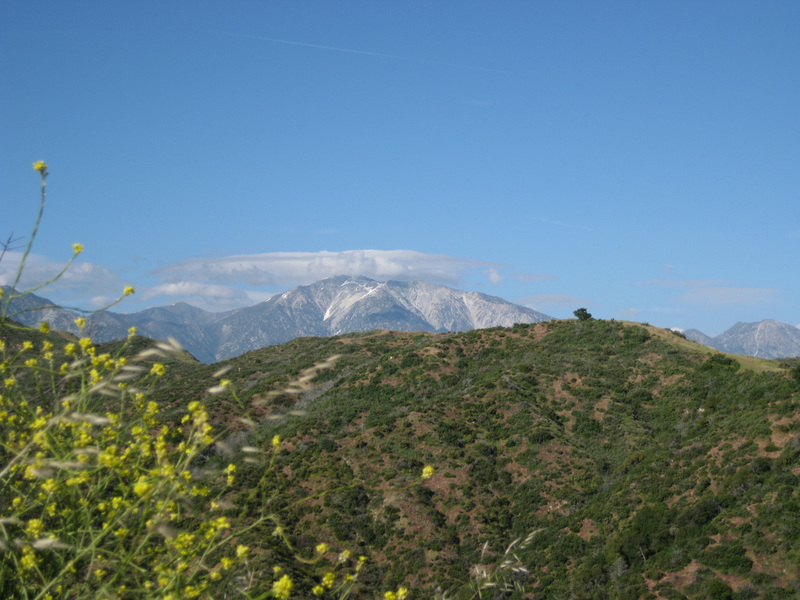 * There is also no overnight parking on Angeles Forest Highway or on Upper Big Tujunga. Rain fell on Glendora throughout the day. It was a cold cloudy ride without alot activity on the road. Three furtive fellows were intent on something north of the ranger station. Birds were chirping about, but not much else. ... of mice and men. 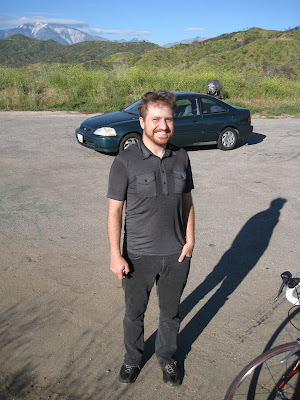 Didn't ride SR 39 to Angeles Crest. Ranger Bob at the Gate said "Road is closed. I can't stop you but you will receive a ticket." There were a crowd of US Forest Service personnel. One group had already been let through. They were waiting for a bus load of Boy Scouts. They were actively working on the road today, Saturday. They would like to open the road for Memorial Day Weekend to Coldbrook Camp. 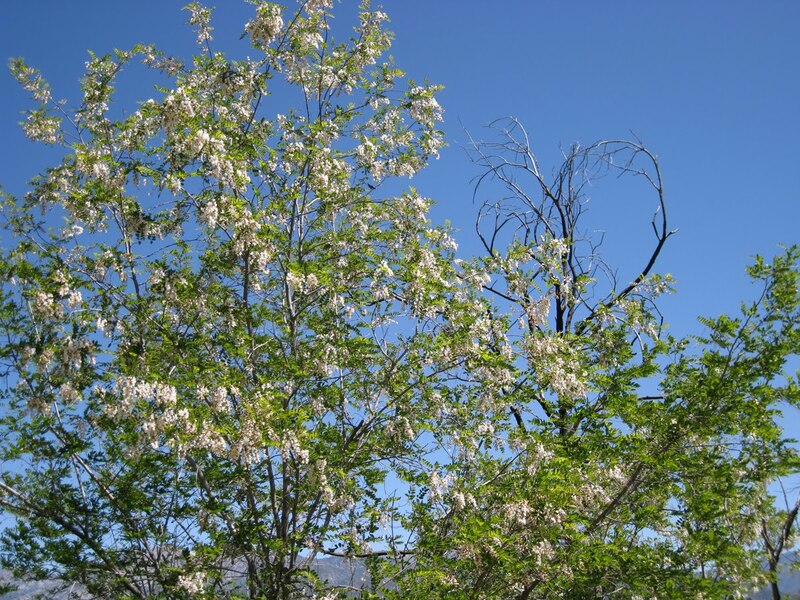 There are corporate donations for project completion. The next goal is to open it to Crystal Lake by July 4th. The Amgen Tour of California starts Sunday. 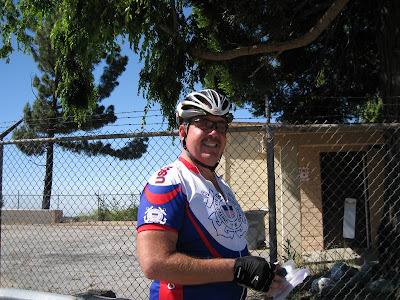 Stage 6 is the epic ride from Palmdale to Big Bear with 12,000 feet of climbing. My plan is to ride SR39 to Highway 2. This puts me somewhere between the Cloudburst KOM and Dawson Saddle KOM. I must arrive prior to the peloton about 11am in time to watch them fly by. Based on my timings last week, I want to hit the road 30-40 minutes earlier today. After training with a 7.8 pound back pack on Wednesday, I have a new rear mounted water carrier. The Wednesday descent from Monroe was quite eventful. It was about 6 pm as I cruised past the shed only to meet up with my arch nemesis a kamikaze squirrel, who decided to play chicken with me in the middle of road. Running straight towards my bike down the center yellow strip as straight as a squirrel can which is to say all over the road. I stopped and shouted while it turned around. Hightailed back along the center line for twenty feet then crossed into the hillside. Feeling confident I only had one last hill to climb on the way home. I was tired. The extra 7-8 pounds does that to you. I was riding slow at the top of the last hill a blind curve around mile marker 7, when a squirrel brained driver in a white camaro or mustang decided to play James Bond and used the entire left lane (my lane) to turn this bend. Being on the outer white line, my choices were try to move to the opposite lane. Nope. too slow. Car too wide. To the right was a dirt turn out. That would mean instantly crashing. I had just a few inches of road on the right which I moved into and thought the skinniest thoughts I could. The driver did move back into the proper lane. Narrowly avoiding impact. I had some choice words for his squirrel like driving patterns. I live to see another day. SR 39 has spoiled me. Beyond the gate there are few vehicles and solitude. Later. CANIDAE will be at all stages of the Amgen Tour of California, continuing to promote an active healthy lifestyle that includes pets and raising funds for the fight against cancer in pets. Felt F5 Team BicycleCycling fans can visit CANIDAE at the Amgen MBT Lifestyle Festivals, located near the finish line at each stage finish. The first stage of the Amgen Tour of California begins Sunday May 16th in Nevada City where CANIDAE will begin a multi-day charity raffle to benefit the American Kennel Club Canine Health Foundation to fund cancer research in pets. The grand prize winner of the raffle will receive a Felt F5 Team Bicycle [pictured] donated by CANIDAE. Founded out of a love for pets and family, CANIDAE Pet Foods promotes an active lifestyle and Responsible Pet Ownership, which includes healthy lifestyles for all of us and our pets. Part of CANIDAE's Responsible Pet Ownership message includes proper medical care and support for pets with health issues such as cancer. Nothing is more central to the core values of CANIDAE than the health, happiness and well-being of pets. At the end of the Amgen Tour of California, the Grand Prize Winner of the CANIDAE Road Bike Raffle will receive a Felt F5 Team Bicycle with an estimated value $2,299. CANIDAE donated the bicycle to the raffle ensuring that all of the proceeds would be available for the AKC Canine Health Foundation and their fight against cancer in pets. Winners may choose their bicycle size and need not be present to win. Tickets for the CANIDAE Road Bike Raffle will cost $2.00 for one or $5.00 for three and will be available in person at the CANIDAE Amgen Tour of California Lifestyle Festival booth at all stages that comprise the tour. In addition to selling raffle tickets benefiting the cause of fighting cancer, CANIDAE Pet Foods will hand out samples and coupons for its line of all natural holistic pet foods. CANIDAE pet foods for dogs and cats adhere to the highest standards of excellence for product quality, palatability, and customer satisfaction. Formulated for the long-term health of dogs and cats, these pet foods are proudly made in the U.S.A. using the highest quality U.S. ingredients. CANIDAE stands behind the guaranteed analysis of each and every one of its products and invites cycling fans to discover for themselves and their pets the healthful benefits of its pet foods. Bill was out and about early today around Bonelli. 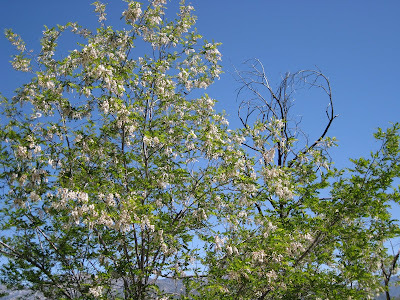 A breath of fresh air for those of us on the ninth floor in Santa Ana, California. Packed a cooler with Gatorade, bottled water and a turkey sandwich. Loaded the bike, backpack (stuffed full of water, shoes, and extras), cooler and the rescue beacon into the car. Drove out and made my way to Highway 39. Passed a couple of dozen cyclists pedaling uphill. Parked at West Fork parking at mile marker 27.19. I spotted a pair of cyclists gearing up to do the same. We met at the first gate a mile up the road. Darren and Phil were on their way to Crystal Lake. I commented that going solo, I had no worries about keeping up. They sprung ahead, then stopped. I passed them by as they checked on cell phones and gear. A brief time later, Darren zipped passed me alone. Phil somewhere behind. It was comforting to have others on the road. Darren stopped six miles in and then we road together for approximately three miles. As I rested Phil caught up with me. We rode off and on for the next seven miles. Sometimes Phil in the front, sometimes I took the lead. At the critical junction, the proverbial fork in the road where the signage seemed lacking, take the right hand turn to Crystal Lake. Phil followed me left and up the hill. It was good to have people in the line of sight. Long story short. 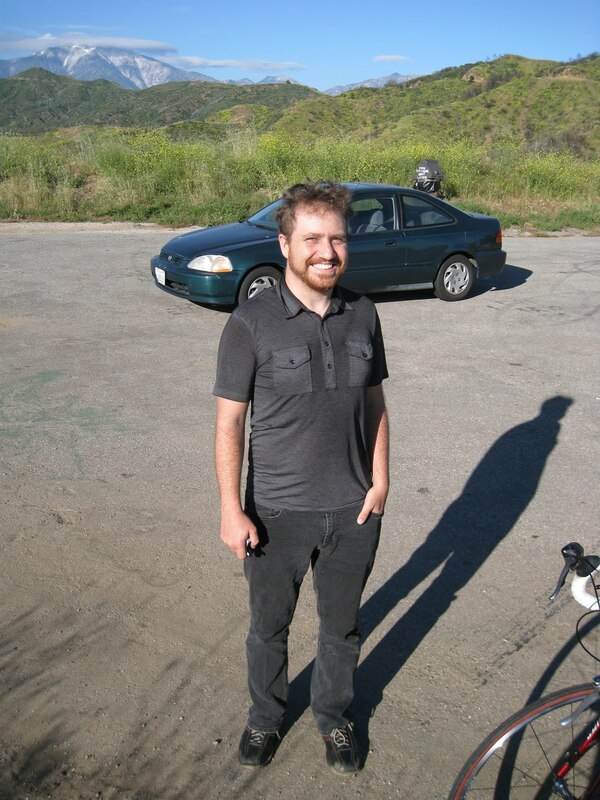 I made it to Angeles Crest Highway. Round trip 34 miles. Ascent 4941 feet. Highest altitude ridden: 6447 feet. Road conditions. From West Fork to Crystal Lake good to ok. Beyond Crystal Lake, SR 39 deteriorates but still ride-able at slower speeds. At the fourth gate or thirteen miles in, the road narrows to a single lane. More cracks in the road filled with tar. More bumps and irregularities. Water from snow run-off. See photos. Again all doable. I made it. Also note the plan is to open SR 39 to motor traffic in October 2010. Get your ride in now. Most of the pictures are from the downhill portion of the ride. Going uphill the bugs attracted to my sweat and skin made pedaling uphill as fast as possible imperative. On the way down, I rugged up and the bugs didn't bother me at all. Great weather. Great ride. Great people along the road. 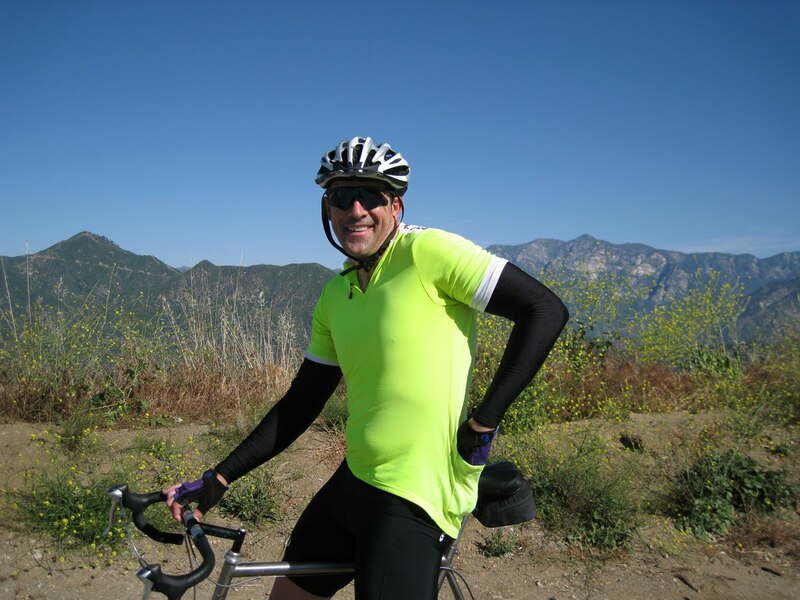 The plan is to ride from West Fork up SR39 to Crystal Lake and then beyond to the Angeles Crest Highway. I want to be biking about 8 am. Check out the ATOC maps for Stage 6. I am headed somewhere between KOM at Cloudburst and the KOM at Dawson Saddle. Talked to a cameraman for the Channel 5 News (KTLA). Chip Yost aired a story on racing on GMR. The teaser of thirty seconds was shown on the six o'clock news. I expect a bit more on the ten o'clock news. The teaser was enough to recognize the tale of woe from the San Gabriel Valley Tribune. One young man who drove a Nissan GT-R recklessly on the mountain, crashed into wall while missing the turn. Lucky for him he didn't go over the side. His next misstep was he claimed his sister drove the car when the accident happened on the 60 freeway to the insurance company. The insurance company caught wind of a youtube video showing his car crashing on a downhill race on the mountain. He tried to back out of the repair request, unfortunately he now has six counts of fraud lodged against him. The cameraman didn't give away any details of the story. He certainly picked my interest. I thought this might be a fresh look at the road. In this instance the print media is ahead of the game. Drive safe. Ride safe. Rode along West Fork once again. Bill and I made it to the Cogswell dam. 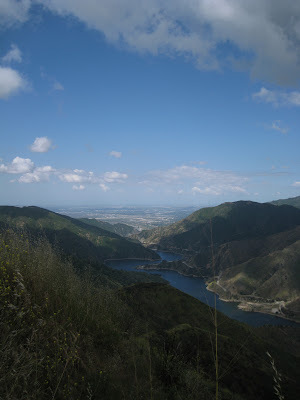 Pictured above is Bill's photo of the reservoir. Last week we were very close! 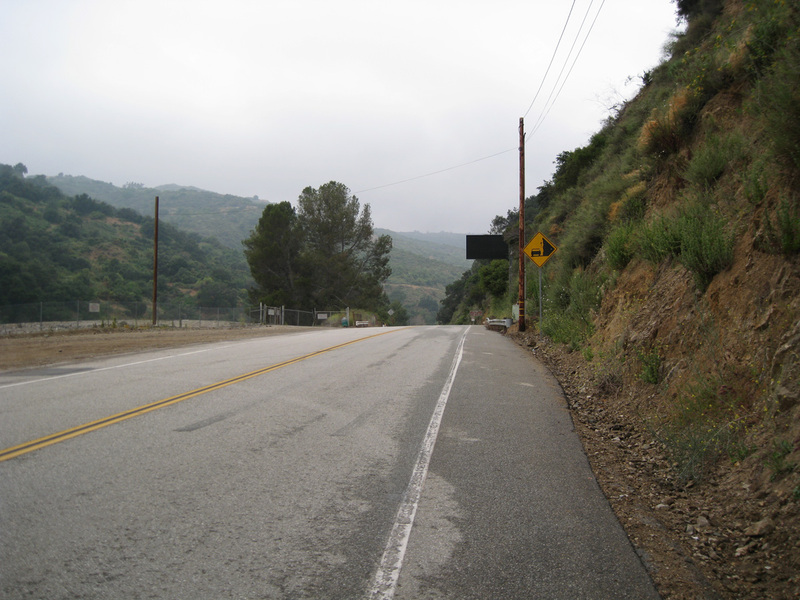 After the hard Wednesday ride up SR39, Glendora Mountain Road seemed like a breeze. Most likely due to the seven pounds of reduced weight. Leaving the backpack at home was an easy decision! It was good to have folks around passing you by, then you pass them! Three mountain bikers and I played tag along the road. Met Kelly and Matt at the shed. Discussed Crystal Lake and Palomar Rides. It has been since December when Kelly and I last chatted. I continued on to Fork plus four. A bit windy, I wanted to get back for a family event. At the bottom of Monroe met up with the Magormold crew. Steve, Matt and Marion. I am hoping someone will write and fill me in on all their names!